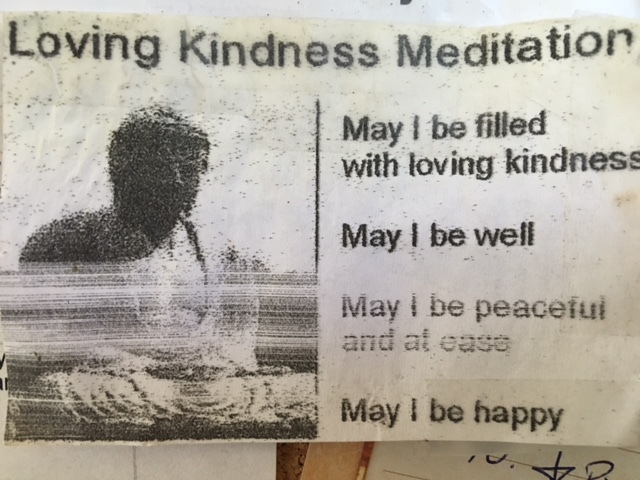 One of my favorite meditations is the Loving Kindness Meditation aka Metta Meditation. The story on this meditation goes back to the Buddha. He was teaching his pupils how to meditate in the woods and they were afraid of the animals, so Buddha gave them this mantra to make peace with the animals and insects that were around them. The beauty of this is you can use it to make peace with nature, other people you know or don’t know, and even to large groups of people like a political party. It can be a tool to make peace! I like to use this mantra to help me through times of worry, or if someone upset me, or if a loved one is ill or dealing with a serious situation or condition (I send it to them in my thoughts). Simply saying these lines and sending intention with your thoughts can have the power to shift what is happening for the better. Here is a basic outline of the meditation and how to get started using it now — even if you don’t need to make peace with any person or nature! Now is the time to learn it so you can use it as a tool when you need it. Sitting or lying comfortably, place your tongue on the roof of your mouth, close your lips, and part your teeth. Take your breath a little slower and a little deeper. Repeat the entire phrase 3 times sending this to yourself. Repeat replacing “I” with “we” and think of someone you love and have NO conflict with. Repeat this 3 x.
Repeat with someone you see often but do not really know 3x. Repeat with someone you highly dislike, have conflict with or find very difficult to send loving kindness to 3x. If you struggle sending loving kindness to someone you personally are in disagreement with it may be helpful to send it to a public or political figure you disagree with.